As if Brexit wasn’t confusing enough (thanks largely to the Maybot and her staggeringly incompetent government), my local supermarket is adding to the chaos. I’ve always found Chinese students very geographically challenged. God knows what they are taught in school. I once gave some university students a blank outline map of China and asked them to mark the locations Shanghai, Xi’an, Beijing, Hong Kong and yes, Liuzhou. They hadn’t a clue. Yesterday, in my local supermarket, I spotted this cushion, obviously designed by a Chinese high school geography teacher. A lovely collection of typical British scenes. Just as I remember it! But hold on! Sacré bleu! Zut Alors! Qu’est-ce que c’est que ça? As we say in England. Paris the capital of Britain! And it looks like the school’s English teacher helped out, too. They kindly pointed out Britain’s capital, Paris is a Mecca for tourists seeking “cluture”. I’m going to have to go back and check it out! Did I buy the cushion? At ¥11.90 how could I refuse?
. This entry was posted on Saturday, September 23rd, 2017 at 11:01 am	and is filed under Education, Humour, International News, Strawberry Fields. You can follow any responses to this entry through the RSS 2.0 feed. Both comments and pings are currently closed. It is NOT the rising sun flag! It is only vaguely similar. The rising sun flag has 16 rays, not the eight shown here). I’m sure it’s meant to be a Union Flag, albeit it monochrome. 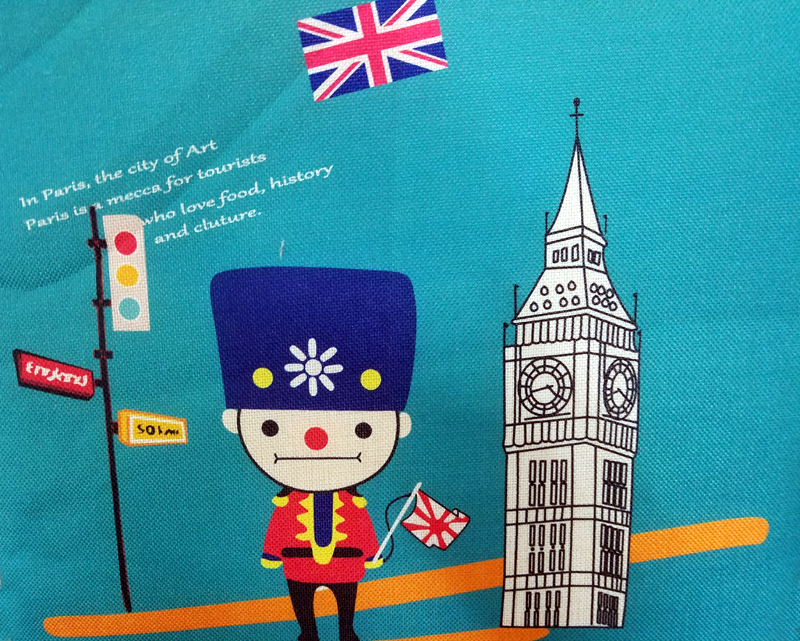 The Chinese love the UK flag as it reminds them of the Chinese character 米 mǐ, meaning ‘rice’. I see it every day, sometimes in one colour; sometimes in the normal red, white and blue..